Use a good baby oil or plain coconut oil generously on your hair, face and body (not just the exposed skin). This helps the colour wash off easily when you shower after the festivities are done. The oil also acts as a buffer and prevents excessive contact of powdered colours with your skin. Using a Q-tip, apply oil to the outer ears and to the nooks and crannies of your nails to prevent colour from lodging in them. Use cotton balls/ear plugs for your ears to prevent colour and water from entering them. Use a good quality lip balm. The colourful water when it dries up leaves sensitive lip skin dried out and dull. The lip balm is a preventive strategy to ensure that lips stay moisturised. Wear a bandana. Your chipkoo hair-style would be hidden well. And your coolness quotient would go up by 1000 points. And your hair would be at the receiving end of minimum contact with colours. Wear full sleeved t-shirts or kurtas paired with pants that reach your ankles – again, for maximum coverage. Thank anyone who eggs your head. J A bit strange but not when you know that egg is a great conditioner for your hair! This gesture of thanking will also succeed in irking the “egg”er because you didn’t get worked up at his smelly gesture. After the celebrations, dust off the excess colour before stepping into the shower. It will be easier to scrub off the remaining colour. It will also help you shower quicker using less water. Teach children to play a safe Holi. Discourage them from smearing colour near their friends’ or family members’ eyes, nose and onto their hair. Ensure that the area where they are celebrating Holi is dry. Be vigilant once they commence playing on wet and slippery grounds after the pichkaris make their entrance. 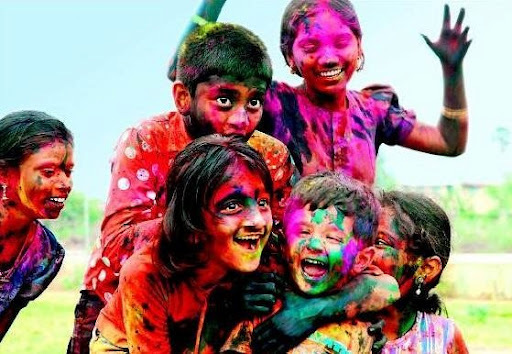 Encourage them to play a dry Holi. This will help them understand the need to save water. When they play with wet colours, strictly enforce a “no muddy water” policy. Children often splash around in the same water which they spray onto their friends and stays on the ground. Sometimes, this can lead to them suctioning the water from the ground itself into the pichkari. 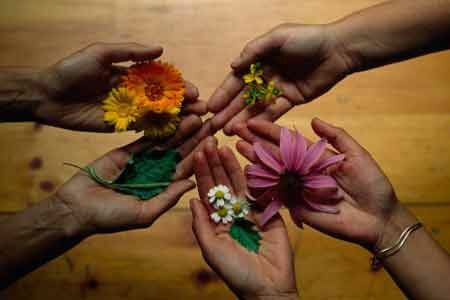 Avoid playing Holi in unfamiliar localities. Have a trusted friend accompany you to and from your place to theirs. Wear no jewellery. It will stain and you will need to take extra effort to polish and clean it later. It also might make you more susceptible to street crime. 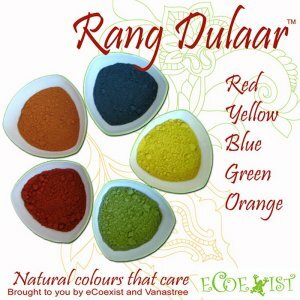 Make pichkaris and colours at home. For information on how to do this, refer to our earlier post on how to celebrate a chemical free Holi. Discourage friends and family from throwing rubber balloons and water-filled plastic bags. Use your worst clothes – preferably those that are on their last wearable cycle. Rags, torn denims, dark coloured clothes are a plus. You don’t have to put time, money and effort into washing them at home or giving them for laundering. If you plan to eat or drink, keep antiseptic soap at hand. Or carry a hand sanitizer. Keep over-the-counter anti-allergy tablets handy if you or anyone you know may have an adverse reaction to any colours. Do not over-indulge in any intoxicants. Categories: Sustainable Living | Tags: celebration, eco-friendly, festival, green | Permalink.